The fun element was just about sky-high at Neha and Ankur's wedding. We loved the creative banana leaf - marigold props and the interesting signboards! The couple really knew how to set the off the entertainment at their event with all the wedding games as well. Look out for Neha's sangeet outfit and wedding outfit with an uncommon colour palette. 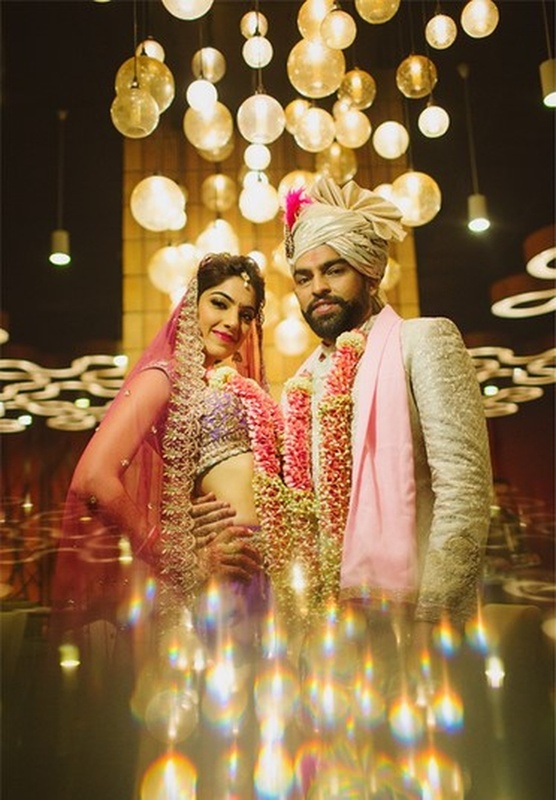 Neha and Ankur’s mehndi ceremony was filled with fun wedding games, pretty décor, wide smiles and a lot of laughter. The suspended glass orbs with floral petals inside them added a nice touch. The tug of war game also had a wedding twist to it that had everyone enjoying to the fullest. What stood out at the Sangeet was Neha’s unique choice of attire. She ditched the usually worn lehenga-choli for a pair of gold toned dhoti pants and a forest-green top with gold embroidery to match. She accessorized with a pair of statement earrings and a few bangles. Loved the look! Makes so much sense to wear an outfit like this at your Sangeet, what will all the naach-gaana! Ankur looked handsome in a maroon silk jacket and dhoti pants that complimented his bride’s outfit. The dance, drama and dhamaka at this sangeet function were palpable. The bride seemed to be having the most fun, belting out some killer moves effortlessly. The guests were not far behind in matching up to her though. Look out for the creative props and fun signboards. The wedding day started off with a Haldi ceremony. Both the bride and groom chose to wear all white for this function. Love the detailed embroidery on Neha’s outfit. Her kaleere with crystals was just gorgeous. What stood out though was the backdrop of banana leaves adorned with marigold flowers. Creative, simple and good-looking! The wedding that followed was uber fun, just like all the other events. The bride, Neha looked gorgeous in a lavender and purple lehenga-choli set with pretty gold embroidery. She paired it with a bright pink sheer dupatta and a sparkling set of diamond jewellery. The groom dressed himself in a cream sherwani with gold details and brown leather monk straps. His colourful choice of socks added a quirky element to his look.